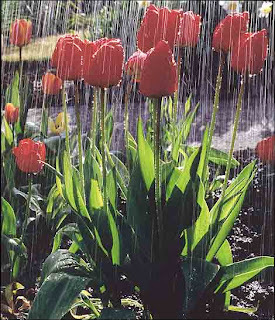 I like the tulip picture with a drenching rain. It says spring in Puddle Town! Mark - Slow and low may be true, and is certainly to be expected. But you left out "amazing" which is also true. We continue to watch in awe how you and your family are handling this from the rainy east coast. YAY! I am so glad that you are doing well! I wish I could come visit, but alas I still have a few more weeks! Enjoy gardening!